Lisbon: Sociedade de Geographia de Lisboa, 1956. First edition. Stapled paper wrappers. A very good copy.. 253-268 pp. Illus. with 8 b/w photos. Sm. 4to. Separate Bulletin from Sociedade de Geographia de Lisboa, July-Sept. 1956. 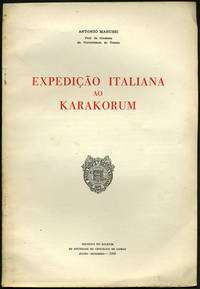 History of the explorations of the Karakorum and the Italian expedition of 1954-55. In Portuguese with summary in English. Antonio Marussi, Geophycist, was one of the expedition members. Not in Neate. London / Dublin: Printed for Knight and Lacey, Paternoster-Row, and Westley and Tyrrell, 1825. A new edition with considerable additions; including an appendix, containing several valuable tables. Printed paper covered boards. Spine repaired with binder's tape, boards rubbed with a few chips at the edges, a few scuff marks, one affecting the word 'wood' on the front board and one affecting a few letters of the advertisements on the rear board, front endpapers soiled, fly leaf torn and split from gutter, small chips to top edge of a1 and a2 probably from opening roughly, some staining to last page of index and blank, occasional finger soiling, but overall remarkably clean, crisp, and tight, and even scarcer thus as most copies and manuals of this nature usually disintegrated from use.. xii, 95 pp., . 16mo. Printed by T. C. Hansard. The first known edition of this book was published in 1809, though it was then only 36 pages and the author identified as Peter Weber. 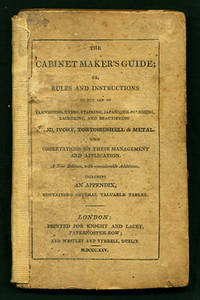 A later edition, only slightly expanded, was published in 1818, and the author was identified as Thomas Howard. This new edition was greatly enlarged and published in 1825 (there was also a longer edition published in 1825 by a different publisher). The author is identified in later editions as G. A. Siddons. The edition offered here is the basis for the first American edition by Ansel Phelps published the same year as well as the source of all later editions into the 20th century. Robert Mussey, in his introduction to a reprint of the 1827 American edition, points out that this work contains the first mention of French polishing and of glass-paper (sandpaper). Hundreds of thousands of copies were printed in the fourteen known and over seventy pirated editions. "Students of furniture and finishing history should find this an invaluable source for the interpretation of our antique furniture heritage." Advertisements on back cover. Scarce. OCLC shows only 5 copies of this edition. 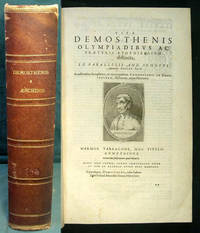 Francofurti [Frankfurt am Main]: Apud Claudium Marnium, & Haeredes Iohannis Aubrii, 1604. Second edition. Quarterbound later morocco over marbled paper-covered boards. A 17x11 cm. section of the title page, which includes the printer's device, has been excised, the leaf neatly repaired; top edge lightly trimmed, boards and spine rubbed with scuffing to the top edges, otherwise very clean with occasional cross-references penciled in the margins, binding tight; a very nice copy.. , lxxiiii, , 1464,  pp. Illus. with 3 engravings, head and tail pieces, and initials. Folio (38 cm). Greek and Latin in parallel columns. Numerous typographical errors in pagination: nos. 1177-1178 omitted, nos. 1453-1454 duplicated. Publisher's device has been excised from the title page but is present on last page. Engraving of Hieronymus Wolf on 8th leaf. Hieronymus Wolf (1516 - 1580) was the sixteenth century German historian and humanist who coined the term Byzantium. The first printing of this edition with notes and commentaries was published in 1572; this, the second edition, varies a little in the order from the first. A third, published 1607, left off notes and is quite inferior. Institutional bookplate noting the book was a gift of Michael J. O'Farrell, the first Bishop of the Diocese of Trenton, on the free front end paper. Scarce. Brunet II 588.